Organize a trip to see it with friends. You'll laugh, you'll cry, you'll wonder how our society ever became so ill with consumerism. Sacrilegious? Yep. On target. Yep. A must see? Absolutely. "A fast and funny documentary ... might make a viewer think twice about that next purchase at The Gap." Brace yourself for the onslaught of the holiday season "shopacalypse" with this hilariously insightful new documentary from executive producer Morgan Spurlock (Super-Size Me), starring the one-and-only Reverend Billy and the members of his Church of Stop Shopping! Filled with biting satire, wacky humor, revealing interviews with psychiatrists, politicians, kids and their exasperated parents, and the gale-force charisma of Rev. Billy himself, this is the perfect holiday film for anyone who's "mad as hell and not going to take it anymore!" Rev. Billy joined CODEPINK in the hallowed halls of Congress for “Don’t Buy Bush’s War” actions this past spring. Can you say, "Peacealujah!! my friends? CODEPINK & Global Exchange cofounder Medea Benjamin, and LA and DC CODEPINK activist Tighe Barry are traveling to Pakistan as a CODEPINK human rights delegation to Pakistan. A letter from Medea per this delegation and its mission follow. Codepinkalert.og will have blogs and reports from Medea and Tighe on the site as they are received. Hold them and peace in your hearts. Human rights activist Tighe Barry and I are on our way to Pakistan today. It's a bit of a trek--leaving from New York to Abu Dhabi (United Arab Emirates), where we have an 11-hour layover, then on to Karachi for a week, then Lahore and perhaps Islamabad. This is the beginning of what we hope will be an on-going presence of US human rights observers in Pakistan until the elections are scheduled to take place in January. We've been very troubled by the state of affairs since General Musharraf imposed martial law on November 3. Under the guise of the war on terrorism, he has jailed thousands of lawyers, human rights advocates and opposition leaders. Some have been released, but many remain in prison or under house arrest. He sacked the Supreme Court and then stacked it with his own judges, thereby wiping out an independent judiciary. And he clamped down on the press, closing several stations and restricting others. So we are going to learn more about the situation, hoping to interview the lawyers and activists who have been victimized by the crackdown. We'll get their stories and learn how we can be of support as they take great risks to bring the rule of law back to their country. With the US government shoring up Musharraf and continuing to give millions of our taxdollars to his regime every month, we in the US have a great responsibility toward the people of Pakistan. Thanks why this trip--and hopefully the subsequent delegations--are so important. Below is a description of the delegations and their purpose. We hope you'll help us spread the word, so that more people from the US will join us or donate funds so that others can come. Much love and happy holidays to all. The Ad-Hoc Committee for the Rule of Law in Pakistan (ACRLP) is organizing a series of delegations to Pakistan starting November 25, 2007 and continuing through January, 2008 -- when elections promised by President-General Parvez Musharraf may or may not be held. The delegates include lawyers, human rights activists, free press advocates and labor supporters who will travel to various parts of the country to meet with Pakistan-based democracy activists, as well as representatives of local political parties. To educate the U.S. public about the dire situation in Pakistan, its implications for the region and U.S. national security, and how to support a return to democracy and the restoration of the rule of law. If January elections do indeed move forward, to assess the conditions for free and fair elections. On the ground in Pakistan, we will be assisted by professors and students from the Law and Policy Program of the Lahore University of Management Sciences (LUMS). The first delegation will start the week of November 25. Funds to support the effort. Checks (tax-deductible) can be made out to Global Exchange/Pakistan and sent to 2017 Mission St, 2nd fl, San Francisco 94110. Please forward this letter widely and ask that recipients take action. The signers of this letter are some of the most involved and informed individuals in the Progressive community. Take a moment to consider that pressure must begin to come from the global community to get the U.S. out of Iraq. Our supposed leaders in the U.S. ignore the wishes of the citizenry, this is the next best hope. Peace. The United Nations Security Council will soon consider re-authorization of the U.S.-led occupation force in Iraq. The Iraqi cabinet, led by Prime Minister Nuri al-Maliki, is about to send a letter to the Council requesting extension of the mandate of this so-called "multinational force." The U.S. government is drafting a Council resolution, and the vote will come up in a matter of days. But the Iraqi constitution clearly calls for ratification by the parliament of any such international agreement. And the parliament is demanding a voice. Last April, 144 members, a majority of Iraq's parliament, signed a letter calling for a timetable for withdrawal of occupation forces. And the same letter denounced as "unconstitutional" a move by the al-Maliki cabinet to unilaterally request a mandate renewal without consulting the parliament. As the current mandate comes closer to expiring, it appears that al-Maliki, under pressure from the U.S., is about to repeat the same unconstitutional and illegal process. In May, by majority vote, the Iraqi Parliament passed a law reaffirming the Constitution's requirements – that the cabinet must get two-thirds majority approval from parliament for any force renewal request to the Security Council. An overwhelming majority of Iraqis want a complete withdrawal of all the occupation forces, as numerous polls have shown. While the Bush administration insists that it wants to "build democracy," it is ignoring the Iraqi people and their elected representatives. Washington wants to renew the UN mandate without approval of the Iraqi parliament-- another illegal step to justify and prolong the U.S.-led occupation. TELL YOUR GOVERNMENT TO STOP UN SUPPORT FOR OCCUPATION! ANY EXTENSION OF THE UN MANDATE MUST BE RATIFIED BY THE IRAQI PARLIAMENT AND INCLUDE A TIMETABLE FOR TROOP WITHDRAWAL. 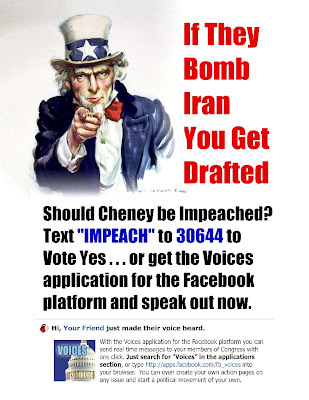 Just got this impeach Cheney campaign info that is aimed at draft age students. I suggest forwarding it to every teen and young adult you know. ￼You will need a Facebook account to access this page. Okay... do you get it now? We've supported a military dictatorship in Pakistan since 1999 and enabled this rogue dictatorship's development and ownership (and thus USE) of nuclear weaponry. Yes -- we -- not our government... not our administration, not any other euphamistic term that downplays our individual responsibility for allowing this to happen. Listen for the use of the phrase "came to power" by the talking heads rather than any referenced to an election. Whatever the Bushites do, we do, because we are not stopping them. I cannot continue to use language that separates we the people from we the government because it leads to dangerous societal dissociation. WE must stop using language that minimizes our responsibility for the fascistic government we have governing us. Language is power. The language we use in the present changes future pattern of thoughts and thus what is likely to happen. While not all things scale up, I think this is an organizing principle of social systems. We must visualize and speak of a societally created, better and just governance or we will have no chance of enacting it. So -- this week's exercise: watch how the corporate media describes the Pakistani military dictatorship's suppression of the fragile tendrils of democracy in the courts and government and how you talk about the situation.